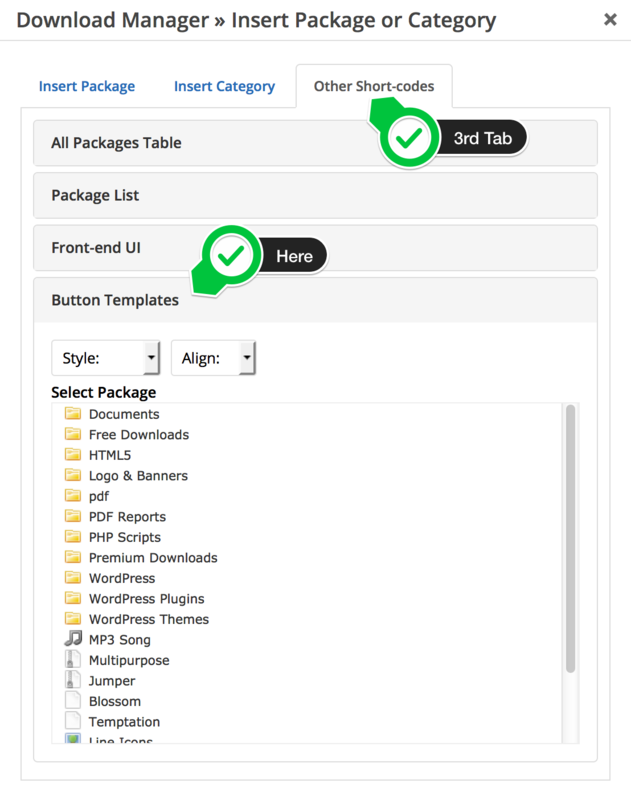 WPDM Button Templates will add an additional short-code code with WordPress Download Manager Pro, which will help your to create css3 buttons styles link template with different style. i’ve added the shortcode but the button doesn’t appear with the template selected but trasparent. please give me the exact short-code you are using. that should work fine except your theme css causing any conflict, anyhow please post a temporary wp-admin login info in with a private reply in forum to check it in details. Is this only for the pro Version ?? Is there any way to make that all the button will be a link to the download? not yet, but I’ll add the option with the next update of the add-on. The button template is quite elegant. Is there any way of incorporating the number of downloads? Hi, thnx for these great plugins! I’m using WPDM, with addons TinyMce Button and Button Templates, on a kind of member site (created with Members plugin). Here’s what’s going wrong with Button Templates. The member site has content only available for users who are logged in; so when not logged in, the site is empty (just the login screen). At this site I want to protect downloads/files in such a way, that only logged in users can download, even if someone knows the direct URL. The good thing of these links is that, when logged out, they do not work; a user who is logged out cannot download the file, but gets redirected to the login screen. Intended or not, this is what I want. I realize I can set the ‘Allow Acces’ to all seperate roles that are allowed to download the file – and remove the ‘All Visitors’ option; however, why is the download link created by Button Templates different from the one created by WPDM? Need login info to test your site, please post it in the support forum and add login info in a private reply. Hi, is it possible customize button dimensions by shortcode or something else? Hello, I have this problem that when I put align=”center”, it will be displayed in the center but if I click on the button it will not download the file, but instead, it will move to the “left” position and when I stop clicking on it, it goes back to “center” position. And even more, to download it I have to click on the “left” position even when the button shows in “center” position, so it seems like, when I put align=”center”, the button appearance changes but the button is still in the “left” position. Hey. I have the same problem. Right now I have testet this in Chrom and Edge. If I center or right align the button then it will shift left when clicked. Also it will not download the PDF linked to. It is working fine in our demo https://demo.wpdownloadmanager.com/wpdmpro/button-templates-add-on-free/, so if none of you can share your URL, we’ve nothing to do there. As the issue also could be due to CSS conflict with your active theme. The center don’t work on your test site. Hi I have a problem with this addon, NOTHING shows up in the post. Please create a support ticket here https://www.wpdownloadmanager.com/support/forum/download-manager-pro/ and send temporary wp-admin login info as a private reply in that ticket. We have to check your site to find issue. The add-on is working fine in my test setup.